Our Emergency Departments and Urgent Care Centres are busy over the winter months. There are many other options for healthcare in Niagara. Understanding your medical options will help you get the right care as quickly as possible. Please bring a list of your medications to all medical appointmens. Download your medication list brochure. 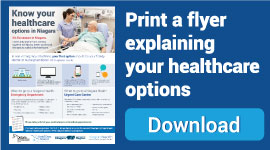 Tell us what you think about the Know Your Healthcare Options campaign here.